All compositions by Kalle Kalima except Dugan Manor House by Kalle Kalima and Teppo Hauta-aho. 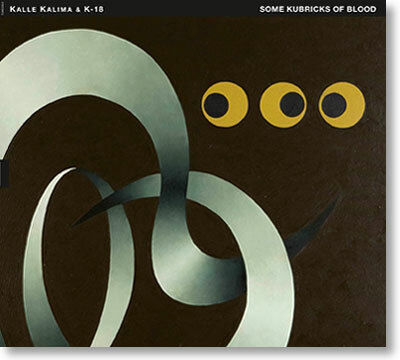 Some Kubricks of Blood is the first recording of K-18, a quartet led by the Finnish guitarist Kalle Kalima, who has for several years been based in Berlin. With this recording, Kalle Kalima, who is known for his work with the likes of Marc Ducret, Linda Sharrock, Sirone, Tomasz Stanko, Simon Stockhausen and Jimi Tenor as well as with three different trios led by him in the past few years (Klima Kalima, Johnny La Marama and Momentum Impakto),has crafted a unique album inspired by the work of director Stanley Kubrick. Featured with K-18 are also saxophonist Mikko Innanen, bassist Teppo Hauta-aho and accordionist Veli Kujala, whose quarter-tone accordion provides the music much of its unique atmosphere. The quartet's uncompromising approach to improvisation and remarkable sense of unity create a sonic entity well suited for representing the moody and immensely surprising world of Kubrick. Some Kubricks of Blood was nominated for the Emma Award as the Best Finnish Jazz Recording of the Year in 2009.